Dan with a very colorful hen from today. Weather was cold but I felt wonderful to get out and catch a lot of nice steelhead and trout. Booking Spring Dates!! Spring Steelhead coming soon to a river near you! We’re taking reservations now for spring chromers on the mighty Muskegon! It won’t be long! Thane showing off a beautiful Michigan Steelhead he took on his pin!! Jammin Jigs tipped with two wax worms and Joel’s Jigs have been our top producers! Salmon fry, steelhead fry, salmon eggs, minnow flies for steelhead. Salmon eggs and fry are a very important food source for steelhead in late winter – early spring. Make sure you have plenty of fry patterns in your fly box! (1/28) Floats and Spawn was the flavor of the day. Fishing was decent with steelhead holding tight in the winter lies. Steelhead were landed in just about every location that we fished. Fat and very healthy trout we landed just about everywhere that we fished. Trout and steelhead are much larger this year. It felt great to get out on the water and have a nice warm day. I was pleasantly surprised at how good the steelhead fishing was today. I can’t wait for the next warm up so I can get on the water and chase some big chrome Muskegon River Steelhead! (1/21/14) Finally, after two weeks of bitter cold, it looks like we have a warming trend coming up for the weekend. Friday, Saturday, and Sunday look like good fishing weather! 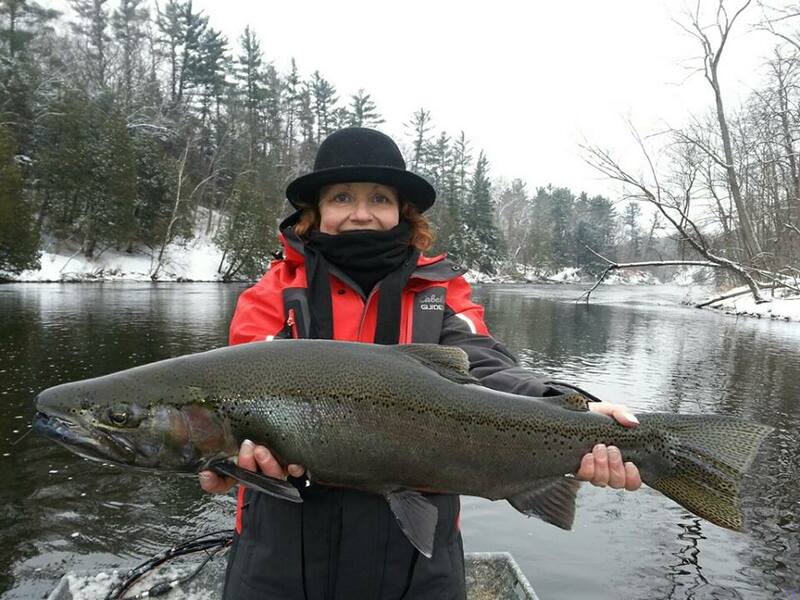 Winter steelhead fishing has been consistently good with perfect water levels and good conditions. Clarity is also good. Floats and spawn has been fishing very good, hooking well over a steelhead per or more. There’s also been a bunch of fat resident trout to be caught. I’m sure everyone is very much looking forward to getting the heck out of the house! Fishing this winter continues to be amazing! Landing double digit monsters has been a daily occurrence. The great conditions are already spilling over into the spring. With the calendar quickly filling up, you should book your spring trips now! Mid March to late April is our busiest time of year, running 5 boats each day. Late March and April offer great fishing, at a price, extremely crowded with lots, and lots of boats. Our catch rates actually go down in March and April because we have to “Share” the fish with so many other boats. Winter Steelhead offers the best of both worlds, lots of fish and action, without any boat traffic or other anglers preasuing the fish. Winter steelhead is consistently good, usually landing over one steelhead per hour! Reservations are usually shorter notice this time of year but we can gladly float your deposit to a day with comfortable weather between now and Febuary 15th. Give winter steelhead a try. We look forward to fishing with you! Shawn displays a gorgeous Winter Steelhead hen. There is something special about a great day of fishing, and having the river to yourself. Winter Steelhead fishing offers the best of both worlds, great fishing with lots of hook ups, peace and serenity. Having the river to yourself. Mike with a gorgeous winter’s buck! This fish was a great fighter, mean, with a feisty attitude!! Steve with one of many nice, bright hens. Plenty of steelhead brought to hand this time of the year.